Started by joj - April 11, 2019, 8:30 a.m. The video is only 10 minutes Mike. I'm interested in your response to the points made in the video. Keep your response to 1 page if possible (think of me like president Trump) ... Bullet points. Are you sure you want to delete this post: Antartica Ice Melt? By metmike - April 11, 2019, 12:04 p.m.
Threads like yours are my absolute favorite..........by a wide margin. It allows me to assist those that are getting misled by convincing sounding speculation based on junk science by providing the REAL science and showing the difference between the unjustified sensationalism to alarm people, which dominates from the MSM vs the REAL science. "Keep your response to 1 page ... Bullet points." Even if this was not a topic that you know is science and is likely going to require this scientist using more than "1 page" it's absurd for anybody to tell somebody else here what form their response should be in. In this case, that would mean no graphs or charts showing the empirical data(which apparently you don't want to see)............the absolute proof of the truth. Bullets points are words. Anybody can use words to say anything they want, like PBS did, like CNN does. My most powerful ally is that the data is the data and no amount of words can dispute that. So you will be getting more than "bullet points" because this will be a complete, scientific answer..........not an exercise in manufacturing a crisis using words or in rebutting the manufactured crisis with just nicely formated words using bullet points. So this is my first/opening page response. Not sure how many pages I will use because there are a couple of different items to address in the video and I have thousands of different data sources, a couple dozen on sea levels and ice. Are you sure you want to delete this post: Re: Antartica Ice Melt? By metmike - April 11, 2019, 12:33 p.m. Since the focus of the story is the threat of sea levels increasing, let's start out with the actual data for globally averaged sea levels going back the last 26 years from all sources. The average is 3.35 mm/year, which is .13 inches/year, 1.3 inches/decade and 13 inches/century. Sea levels have been increasing at a similar but slightly more upward increase recently than since 1880, when the first measurements started at some locations. This graph comes from REAL empirical data from REAL REAL sources on the REAL planet. One can see a very tiny slow down 5-15 years ago, during the warming "pause", then back to the previous rate since then. Are you sure you want to delete this post: Re: Re: Antartica Ice Melt? By metmike - April 11, 2019, 1:03 p.m. This next one is the most comprehensive amount of data that you will get on individual stations.....going back to 1880 in many cases. It's impossible to see the number/years/values and station identity below(go to the link to get that) but the reason to copy all of this is for you to notice................the trends at all 159 stations. These are easily seen. Do you notice an acceleration upward in recent years from sea levels increasing on most of them? No, because it;s not there in the data. Do you notice an acceleration upward in recent years on half? or even some? No because its not there in the data. Yes, the trend is up...........but like it has been, at the same rate up from left to right......from the start of the measurements to the last one. No major acceleration upwards/increase in the rate over the past 140 years. That rate, has been just over 1 inch/decade..........equating to 1 foot increase in the next 100 years. Out of 159 stations, I can't find any that are increasing at a much faster rate then they have been for most of the last 140 years. In fact, some are decreasing(there are other factors that affect the land/sea boundary related to land movement and other things). If Antarctic/Arctic/Greenland/glacier ice melt is accelerating and contributing massive amount of water to the oceans...........it's not showing up in the measurements of the sea levels(the actual oceans). I have a theory to explain part, to maybe most of this. There has been an increase in precipitation from the warmer oceans/atmosphere........with increasing evaporation off the oceans taking out some of that moisture, which has been redistributed over land..........including greater snows in the Antarctic on top of the ice pack........which turns into more future ice. Without question, there has been an increase in precipitation over land and an increase in soil moisture(with a slight decrease in global drought). Also vegetation and plants have massively increased. They are holding on to some of that moisture. Regardless of why, the seas have not been accelerating higher anywhere the past 20 years............except on some global climate models going out for 100 years which have all been too warm during that period but never get adjusted because that would destroy the talking points/narrative of the imminent climate crisis. By metmike - April 11, 2019, 1:16 p.m.
As you can see from this data, there hasn't been much change. I can't copy the graph from this link, so you need to go to the link to see it. There was a period, less than a decade ago, when the ice in Antarctica was actually making new record highs, despite global warming...............this was very baffling, especially since all the models predicted the opposite but is evidence that there is much more going on, the science is NOT settled the global climate models are rubbish. The increase in ice down there was just temporary but again, the melt is NOT accelerating at a dangerous rate based on most objective measures. Are you sure you want to delete this post: Re: Re: Re: Antartica Ice Melt? By metmike - April 11, 2019, 1:25 p.m. Here's an even better source for Antarctic ice. Again, this is empirical data that trumps words and speculative models using extreme scenarios from computer programs simulating the atmosphere for the next 100 years and it trumps words from tv show soundbites or reporters or newspapers. By metmike - April 11, 2019, 1:35 p.m. So now that you know the TRUTH and the authentic science, about the Antarctic and sea levels, you will be able to appreciate why the PBS story is NOT the truth or the authentic science. They discuss the dire consequences to people with oceans 5 feet higher but never tell you what the real increase that I showed you is.......... even the IPCC using busted, too warm global climate models doesn't even predict half that. At the current rate of increase, it will take almost 500 years for the oceans to go up 5 feet. There is a chance that the rate could increase and get there faster but its extremely unlikely to happen in 100 years. And we should keep in mind, much higher seas would be BAD for humans living along the oceans............but why is it a crisis for the rest of life on this planet? They take a sound bite from a scientist that studies ice cores who tells us that "120,000 years ago, when temperatures were 2 degrees warmer than this, sea levels were 6-9 meters higher(20 feet). They leave that statement out there as if its a fact, that when our planet warms by 2 deg. from the increase in CO2, we will likely have oceans 20 feet higher............we are headed there because of this correlation. At the current rate of increase, it will take nearly 2,000 years for the oceans to go up 20 feet. Again the rate could accelerate higher at some point but its numbskull science to be suggesting that will happen in the next century. Do they counter that with 1 iota of actual data or a statement that shows at 2 deg warmer we WON'T have oceans 20 feet higher? As in this REAL fact, that 5-9,000 years ago, when temperatures were 2 degrees warmer than this(and one might wonder how it was warmer than this back then and it was called a climate optimum) that sea levels were LOWER than this...........though we were coming out of a period with much higher glaciation previous to that. Temperatures on the right are the latest, to the left the oldest. Sea levels have been rising at 1 inch/decade = around 1 foot/century over the last 150 years. Today, it's around 1.3 inches/decade. By metmike - April 11, 2019, 3:06 p.m. I think it was called Katrina 2060. My wife found it and called me over to watch. Jim Cantore, who I have always loved because of his enthusism was the host(and I still love him despite the story). They started out with him on one of the levee's by New Orleans, telling us how hurricanes would be much stronger in 2060. My wife had to listen to me explaining that there has been no trend in number or intensities of hurricanes based on the data from the last 40 years(though I agree that intensities of some hurricanes will likely be stronger with warmer oceans and cause more rain for sure with a warmer atmosphere/ocean). Then, Cantore stated that the levee he stood on was built to protect from a hurricane Katrina flood/storm surge but Katrina happened in 2005. He went on to say as fact, "In 2060, when sea levels are 2-5 feet higher(and they showed a graphic, so this was scripted/intentional/prepared), imagine how much water will come over this levee!" In 2060, if sea levels keep increasing at the same 1 inch/decade rate as show earlier based on empirical data, the levels will be, at the most 5 inches higher.............not 5 feet. He overstated the increase by more than 10 times as if it was a fact. So I got revved up telling my wife this and she said "How do you know that they are all wrong! How can they all be wrong and you be the only one right?" How many times have I been asked that question?......and by her before too. Time to show the perfect video to her. I told her that I had the data to prove it, their position is based on speculative models that have all been too warm and they won't adjust them to the real world and they won't debate guys like me because they know they would lose. They won't debate us? Why not, if the science is settled. They should be embracing every opportunity to make us look like fools in debates by showing the settled science..............while we look dumb. So I showed her the first few minutes of this climate debate between the "denier" Dr. Roy Spencer and the guy representing the "settled science" crowd, Dr. Gavin Schmidt, working for the government. The most telling part however, was that Stossel invited a dozen other prominent scientists that represent the supposedly settled science, mainstream view of catastrophic man made warming/climate change and not one of them would even come on the show. If what you represent is authentic and you have the truth and data to support it...........and its your area of expertise, why in the world would 12 straight climate scientists be afraid to come on the show to present it, then have it questioned? but when it comes down to the authentic science and truth................which they hide from...........they are wrong. Could sea levels be 20 feet higher in a century? Yeah, maybe 1 in a 1,000 chance...........even that seems generous. But 2119 is 100 years from now, 2060 is 41 years from now, the Green New Deal is 12 years from now. You can manufacture any reality you want for the distant future and sell it today and never be held accountable............unlike a meteorologist is when forecasting this weeks weather..........and is wrong. Or when most people, in most professions are wrong..........they are held accountable...........and pay a price.........that's reality. Climate science has been hijacked because it never has to be held accountable for 100 year forecasts. Being wrong the last 20 years didn't change those forecasts that feature a climate crisis .........in fact, because people didn't act as hoped for, the lack of a crisis has been twisted into "the crisis is worse then we thought"
The better it gets.................the more they have to exaggerate the manufactured (fake) climate crisis to scare us. Are you sure you want to delete this post: Re: Re: Re: Re: Antartica Ice Melt? By joj - April 11, 2019, 7:28 p.m.
As I said. Too much for a simpleton like me to read. But I skimmed and didn't notice you addressing the ice shelf (I forget the term they used) the size of Texas with a crack having recently developed. And the prospect of that breaking off and sinking into the ocean. By metmike - April 11, 2019, 8:39 p.m.
" Too much for a simpleton like me to read. But I skimmed and didn't notice you addressing the ice shelf (I forget the term they used) the size of Texas with a crack having recently developed. And the prospect of that breaking off and sinking into the ocean. " Again, I am loving this to pieces, whether you want to believe the data or pretend it's above your thinking pay grade so you don't have to believe it......except when you think you might have found something that I missed(which you could have only noticed if you read all the stuff). Please keep the great questions coming. "Collapsing ice shelves do not directly contribute to global sea level rise. This is because they are floating, and so their melting does not result in sea level rise. To check this, put a few ice cubes in a glass and check the water level. Does the water rise when the “icebergs” melt?" So if an ice shelf the size of Texas breaks off, the sea levels will not go up very much. Losing them, however can make it easier for the calving land ice behind them to slide faster into the ocean............but this has been happening for 2 decades now. Note the list below. And what has this contributed to additional sea levels from the ice behind sliding into the oceans? The data says ZERO that we can measure. As shown in previous posts, sea levels did not accelerate higher during or after those collapses. 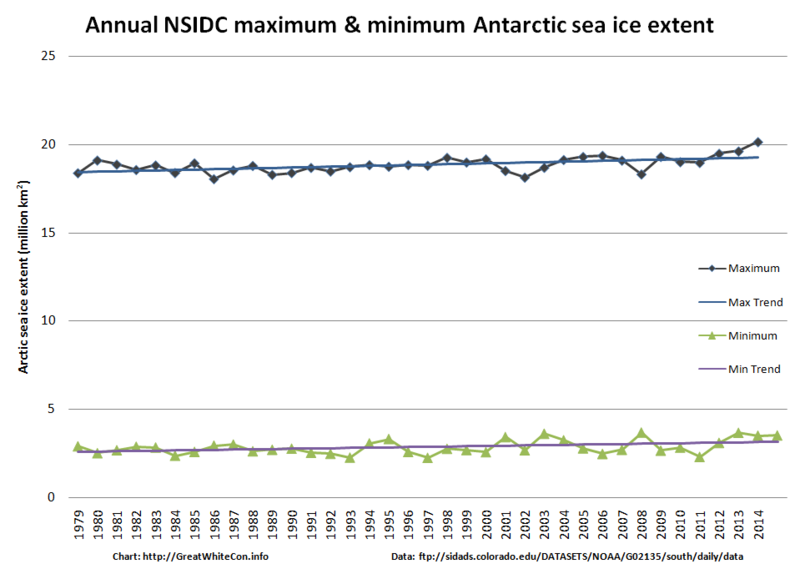 Antarctic sea ice loss and melting has not accelerated according to all the authentic data sources. PBS and the alarmist scientists using words in the story/report, that obviously were chosen because of their extreme, wildly speculative opinions, are making statements that contradict the authentic, empirical data above. You, them and anybody else can never show proof of what they are saying because I have all the data and none of it shows that. There is no secret treasure chest trove of scientific data that metmike just doesn't know about and these other scientists have the key to or that metmike just doesn't want to show because it would contradict his "denier" beliefs. I am showing all the objective, authentic data here relevant to see.........and even much more than you apparently would like to read. Pretend to be a simpleton unable to read and comprehend it if you want joj, you're only hurting yourself. I know that others have learned a few things(Alex, an extreme liberal, told me that I completely changed his mind on Climate Change and he created "Climate Talk" in the library for all of my climate threads on this site during his last 3 years as moderator). Again, I greatly enjoy this and have loved discussing the weather/climate since I was in the 2nd grade and hope you have another good question(that no doubt, others that believe the same thing as you might have). George VI 26,000 Brief absence (9000 BP) Still present & thinning. Confined, which may increase stability. By metmike - April 11, 2019, 8:53 p.m.
"Scientists have uncovered the largest volcanic region on Earth – two kilometres below the surface of the vast ice sheet that covers west Antarctica." "Antarctica’s Pine Island Glacier is melting, thanks to warming waters from below. What’s more, a recent study has discovered a volcano beneath the glacier." In case you don't know it, increasing CO2 and man made climate change can't affect volcanic activity. Do you think that a bunch of volcanoes spewing hot lava underneath a glacier might contribute to some warmer water and melting. By GunterK - April 11, 2019, 10:47 p.m. If it wasn't for you, I would be believing all these scary "global warming" stories. I am grateful for your never-tiring effort to point out the other side. Seeing factual data and graphs makes a very believable argument. Yet, what I wonder..... why are so many 'scientists' following and advocating the other story line? I can't quite understand their (political?) motives. By metmike - April 12, 2019, 12:39 a.m. I addressed that with mcfarmer a couple of times. It's late and I don't have time to finish on this point but will do that in the morning. You should know that metmike the atmospheric scientist is included in that 97% number for climate scientists that agree on this topic. Hugh? How can that be with everything that I've stated. That number includes those that believe the warming is beneficial and those that believe half the warming is natural. By metmike - April 12, 2019, 1:45 p.m. I'm thrilled to assist with your understanding of this topic and provide authentic data/science that is completely missing elsewhere, despite the fact that it IS the most important part for this discussion. It's wonderful for you to ask this question because I realize that this aspect has not been fully addressed by me...........and it's very significant. Gunter asked: "why are so many 'scientists' following and advocating the other story line? I can't quite understand their (political?) motives." First of all, scientists are not a bunch of Mother Theresa's with white coats that don't care about money and have no political affiliation, driven only by altruistic motives. Most of them are good people...........but such is the case with the general population and you can see what politics has done to them. This is the first problem that we have. "Naughton’s group, which counts veteran Democratic strategist Joe Trippi among its board members, held a training session Thursday in Washington for scientists considering a run for office. The group says 80 prospective candidates attended the session. That’s in line with many scientists’ politics: Four out of five scientists identify as Democrats, according to a 2014 Pew Research Center survey of American Association for the Advancement of Science members, and more than half describe themselves as liberal or very liberal." Then there's the funding, most of which comes from governments. Governments don't fund studies for non problems. If the climate science community would agree that man made climate change is not a crisis, the funding, that gushes out with gusto would dry up. In another field, corn grown for ethanol. You will never find a farmer that tells you about the many negatives or is anywhere close to being objective,,,,,,,,,,,,,because it's their cash cow. Having a climate crisis, with already liberal climate scientists fits in perfectly with their career's and demand for their product...........scary climate change outcomes based on speculative models. We have many more scientists today that identify as "climate" scientists than we did 3 decades ago. It's a hot field and is attracting alot of attention. There are many hundreds of studies that I've seen, not even focusing on climate change.........that throw in a section or 2 which connect whatever they are studying with climate change...........to vastly increase their chances for funding and for the study to be more "relevant. And it works. Let's look at the conclusions of all these scientific climate change studies. Almost universally, they show bad impacts to humans, polar bears, butterflies, bees, crops, frogs, rain forests............all the good life. At the same time, we see that climate change is always good for ticks, fleas, misquotes, bacteria, weeds, rats and every form of bad life. How can the same change in temperature and CO2 levels always be bad for good life and good for bad life? The truth is that both types of life do better when it's warmer(and worse when it's colder) but we are only hearing about one side because the field is completely driven by that narrative and only wants scientific studies that report it. Lot's more, especially about the UN created IPCC that serves as the climate bible for the worlds climate scientists and the scientifically fraudulent hockey stick temp graph that they used to erase the Medieval Warm Period .........that 100 scientific studies from the past showed as this warm or warmer than this........from climate history......let me finish later. By GunterK - April 12, 2019, 2:56 p.m.
By metmike - April 13, 2019, 12:55 p.m. Thanks for waiting for the follow up. This next story seems almost impossible..............but with absolute certainty, it happened. The United Nations is wonderful organization in most realms. Almost everything they ascribe to, uses great plans to make the world a better place for the billions of poor people.. However, goal number 13 is a complete fraud as I will describe. Initially, the United Nations created the IPCC(Intergovernmental Panel on Climate Change) in the late 1980's. It was determined that this entity would be the worlds authority on human caused climate change and all governments and its scientists would follow their reports as their "climate bible" for what has turned into religious type beliefs about some of the information. Climate scientists around the world, use their reports and its assumptions..........many of which are very speculative. Their predictions have been too warm and wrong but are not being adjusted because what most people don't know, the IPCC is a political body, a governmental entity, which uses their reports to recommend aggressive political actions. Brilliant scientists around the world, use these reports as a starting point without actually understanding how the models work (they are just computer output from programming to simulate the future climate based on a speculative theory with faulty equations that have created far too much warming) and very few are operational meteorologists, for instance that have been objectively tracking the actual weather/climate the past 30 years to see how badly the models have performed. Does this make me smarter than these scientists that have it wrong? Hell no! Most of them are smarter than me. Many have PhD's and did better then me in college and can run circles around me using mathematical equations to represent the physics of the atmosphere. However, I've analyzed the global atmosphere for a living (using models to forecast) for over 3 decades, with a wonderful connection to what's been happening in the real atmosphere, while studying weather/climate history and .............. can judge objectively and accurately how well the simulations of the atmosphere have been doing......not so good in several areas but ok in others. The profound evidence that the IPCC was blatantly corrupted early on, in a way that will be hard for you to comprehend..........but the proof is right here on the following pages. One of the first things that the IPCC did was to erase the Medieval Warm Period from climate history.......because it showed temperatures warmer than this without humans causing it. Several corrupt climate scientists, especially Michael Mann and his tree ring study which led to the "hockey stick" graph played key roles. Seriously, since they were deemed the world's climate authority, wiping out the Medieval Warm Period was accepted by mainstream science despite 100 previous studies that showed it. Despite over 100 studies that contradicted this result(see my source above) they did it and everybody excepted it..........ok, the governments and many of their climate scientists and those who wanted the best opportunities for funding accepted it which is even easier to accept when 80% of you, belong to the same group that supports the political agenda of the climate science hijacking. Now, we had a new climate history graph that showed the current warming was unprecedented. 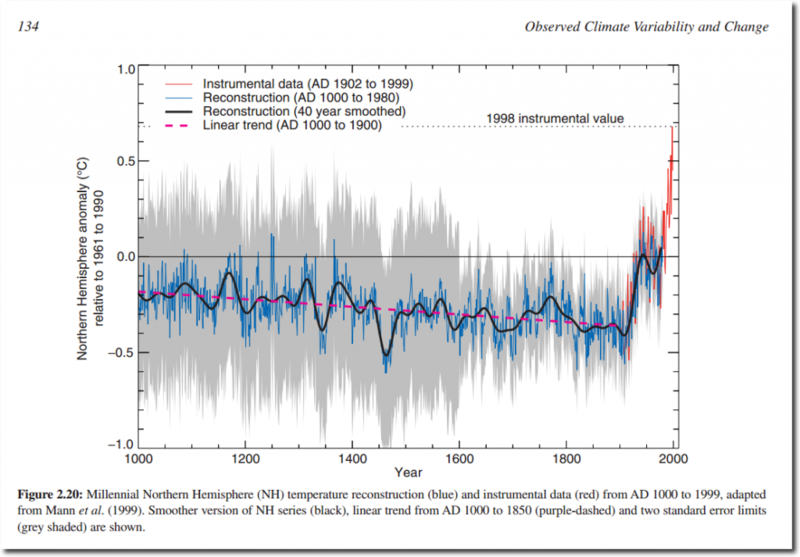 Ministry Of Truth – Erasing The Medieval Warm Period. Are you sure you want to delete this post: Re: Re: Re: Re: Re: Antartica Ice Melt? By metmike - April 13, 2019, 12:57 p.m. The first graph was the one that was featured in the IPCC's first report, in the 1990's, when they were using the 100+ climate history studies that are still valid today............... before they wiped out the Medieval Warm Period. On the 2nd graph, look at the huge difference between the first one in the 1990's and 2001 in order to show that humans were causing all the warming.......no more Medieval Warm Period!!!! The 2nd graph is based on one study, from a set of tree rings, from one corrupt climate scientist, Michael Mann..........all the other ones were tossed out. Believe it or not, the majority of the liberal scientists decided to believe the 1 study(though most don't realize it's just based on 1 study) and all the science of the world authority on climate science,........the IPCC. 2001 IPCC report below, after hijacking climate science. The Medieval Warm Period was completely wiped out(using one scientist's tree ring study) so that the Current Warm Period would appear to be unprecedented and caused by humans. Are you sure you want to delete this post: Re: Re: Re: Re: Re: Re: Antartica Ice Melt? 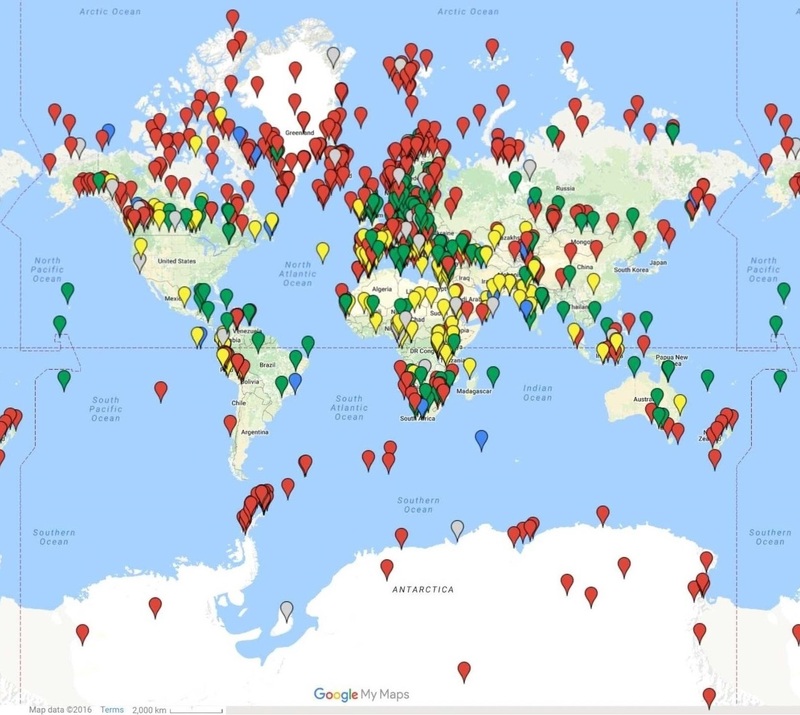 By metmike - April 13, 2019, 1:18 p.m.
From the same site below, over 100 studies from the Medieval Warm Period, most of which show the planet was this warm or warmer 1,000 years ago. It was also this warm 2,000 years ago during the Roman Warm Period and also just over 3,000 years ago, during the Minoan Warm period. Red balloons showed it was warmer. Are you sure you want to delete this post: Re: Re: Re: Re: Re: Re: Re: Antartica Ice Melt? By metmike - April 13, 2019, 1:29 p.m.
And the Holocene Climate Optimum from 5,000-9,000 years ago was even warmer than the Medieval Warm Period. "Out of 140 sites across the western Arctic, there is clear evidence for conditions warmer than now at 120 sites. At 16 sites, where quantitative estimates have been obtained, local HTM temperatures were on average 1.6±0.8 °C higher than now." Are you sure you want to delete this post: Re: Re: Re: Re: Re: Re: Re: Re: Antartica Ice Melt? By metmike - April 13, 2019, 1:35 p.m.
And of course the 97% of climate scientists agree on man made global warming has been a monumental spinning, so that guys that represent views like me are included in the number(how they got 3% that don't believe that humans are causing any warming is what baffles me). 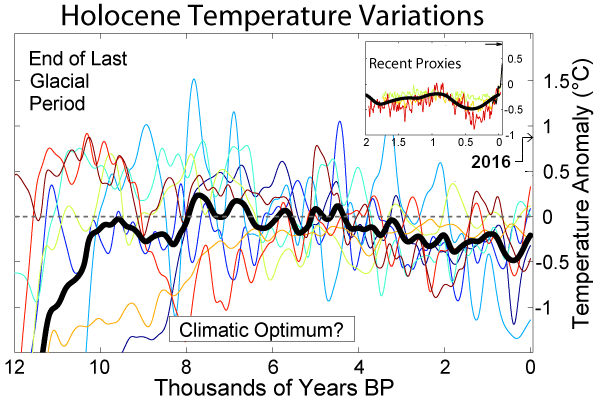 The Holocene Climate Optimum that was warmer than this, did not get that name because the word Optimum is actually a secret code word that really means CRISIS. Are you sure you want to delete this post: Re: Re: Re: Re: Re: Re: Re: Re: Re: Antartica Ice Melt? By metmike - April 13, 2019, 1:41 p.m.
"Most of the world still believes that humans are causing climate change. The belief persists, despite the evidence of deliberately corrupted science exposed in leaked emails, and consistently failed forecasts. It persists without any empirical evidence. Unnecessary policies and massively expensive policies evolved from the deception of certainty. Carbon taxes and alternative energies that are unable to replace fossil fuels without some massive breakthrough in energy storage capacity continue to drain budgets and divert from solving real problems. The momentum behind this deception is amazing and at present unstoppable. It is driven by a certainty that is supported by concocted evidence from the pre-programmed, pre-determined outcome, computer models. There is no empirical evidence, so how and why does the belief continue? How did the idea gain and maintain this force? " By metmike - April 13, 2019, 1:47 p.m.
"This photo shows a tree stump of White Spruce that was radiocarbon dated at 5000 years old. It was located 100 km north of the current tree line in extreme Northwest Canada." "The area is now frozen tundra, but it was once warm enough to support significant tree growth like this. If climate was this warm in the past, how did that happen before we started using the fossil fuels that supposedly made our current climate unprecedentedly warm?" By metmike - April 14, 2019, 2:19 p.m. There have been a select group of climate scientists who serve as the gatekeepers of weather/climate information in this field too. Specifically at the Climate Research Unit in East Angola, England, where all the global climate records are kept. Some of the scientists there, like Phil Jones, also works with the IPCC . In 2009, a whistle blower hacked years worth of emails busting them discussing how to "hide the decline" and "use Mike's Nature Trick" a reference to the author of the fraudulent hockey stick graph that wiped out the Medieval Warm Period and one of his strategies to alter temperature graphs by manipulating data. They discussed ways to thwart attempts by skeptics to get their data in order to verify it and how they would use their great influence in the peer review process. They also discussed plans to use media contacts in the US to destroy the credibility of a guy, Steve McIntyre, that was posting data that contradicted their fraudulent stuff. He figured out how the corrupt Michael Mann and IPCC used 1 tree ring study to wipe out the Medieval Warm Period. "You can see quite easily how by enhancing the weight of the bristlecones and reducing the weight of all the other proxies, you can “get” a hockey stick. You have to work pretty hard to “find” the bristlecones out of this pig’s breakfast of noise; that was Mann’s “new” statistical method. If you take the bristlecones out of this system, there is no Hockey Stick. The science community circled the wagons and ignored all or it. A couple of complete joke investigations took place and cleared them. A panel of like minded scientists said something like, they might not have been very professional but didn't do anything wrong. By pj - April 14, 2019, 3:16 p.m. Looking at the graphs of sea level at the various stations, I'm stuck by how many (mostly in northern places) show a more or less consistent decline. Yet the average of all stations presumably has been rising. The oceans are all connected. Do you know if there's an explanation for the declines? By metmike - April 14, 2019, 4:42 p.m. Wonderful question pj. Very astute observation, that could only happen if you are studying the data. This is a very enlightening one. If you hit the individual graphs, to blow them up as you did, you will see the locations as you did and also note they are high latitude locations as you did already............Sweden, Norway, Denmark, Canada for instance. What was going on 20,000 years ago at those locations? They were covered in glaciers that had enormous weight. So much weight, that it was pushing down the land. The receding of those glaciers since then is actually causing the land to rebound faster than the oceans are increasing. glacial rebound (also called isostatic rebound or crustal rebound) is the rise of land masses after the lifting of the huge weight of ice sheets during the last glacial period, which had caused isostatic depression. Post-glacial rebound and isostatic depression are phases of glacial isostasy (glacial isostatic adjustment, glacioisostasy), the deformation of the Earth's crust in response to changes in ice mass distribution. The direct raising effects of post-glacial rebound are readily apparent in parts of Northern Eurasia, Northern America, Patagonia, and Antarctica. However, through the processes of ocean siphoning and continental levering, the effects of post-glacial rebound on sea level are felt globally far from the locations of current and former ice sheets. 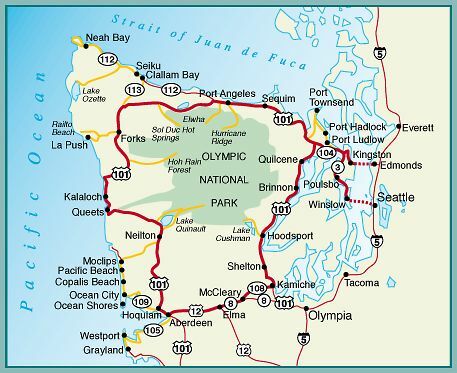 By metmike - April 14, 2019, 4:55 p.m.
For those not familiar with this area, Neah Bay is at the far northwest tip of Washington State. On the map below, you can see it top/left with respect to Seattle, where pj used to live, on the far right/center. By metmike - April 14, 2019, 5:06 p.m. In some places, mainly just south of where the land is increasing post glacial effects are actually causing the land to fall. There are other places on the planet where the land is also sinking. Map of Post Glacial Rebound effects upon the land-level on the British Isles. The red is sinking land. By pj - April 15, 2019, 12:56 p.m. Thanks for all the info. 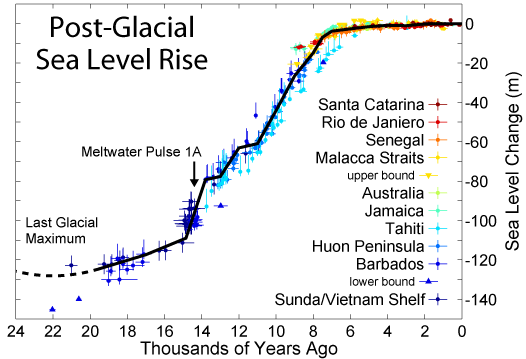 I was aware of the post-glacial rebound effect and it crossed my mind that was what affected the data. When I was kid living in the suburbs of New York, we had a minor earthquake that cracked our basement floor. I remember hearing that the explanation being the post-glacial rebound. Looking at your chart it seems it was more likely the reverse (isostatic depression), although I believe the area I lived in was said to have once been covered with ice a "mile deep". Anyway, it seems to me it would be a complicated/tricky proposition to derive actual sea level rise, using the data from the various stations. By metmike - April 15, 2019, 1:54 p.m.
Agree that changes in the land make calculating changes in the sea very tricky.